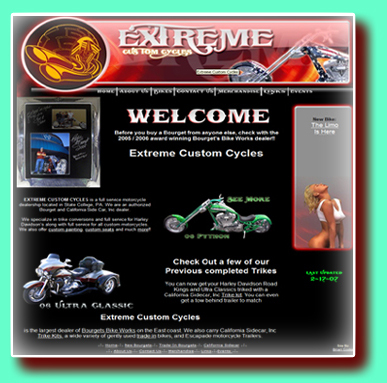 Business: Extreme Custom Cycles is a custom Motorcycle dealer located in State College PA. Extreme Custom Cycles specializes in Bourget Bike Works motorcycles and they also have a fully equipped shop. Extreme Custom Cycles can also turn your Harley Davidson into a custom Trike with a California Trike Kit. 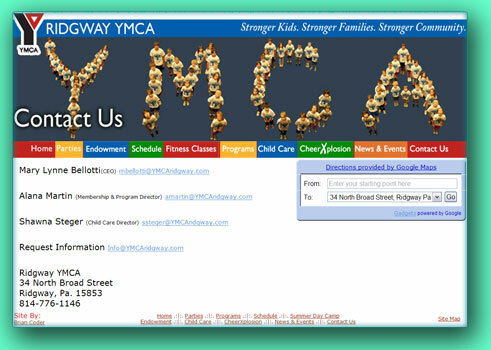 Business: The Vision of the Ridgway YMCA is to be a leader in the offering of healthy programming for all ages while supporting initiatives designed to enhance our positive position as a family centered organization accessible by all. As a leader in our community our well trained team is dedicated to providing distinguished service incorporating the YMCA Core Values: Caring, Honesty, Respect and Responsibility. This vision can only be realized through the support of the community, our members, and individual donors; this allowing the Ridgway YMCA to be the "Charity of Choice." 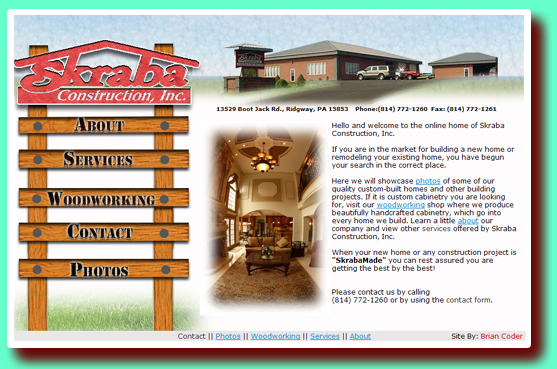 Business: Skraba Construction is a custom home builder located in Ridgway PA. Skraba construction can build your dream home or remodel your existing home with some of the most breath taking wood work you will ever see. 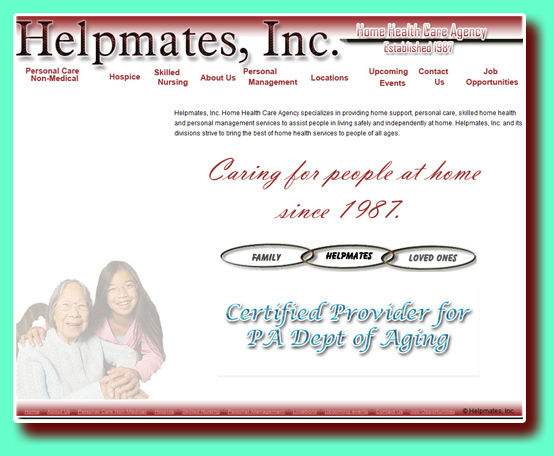 Business: Helpmates, Inc. Home Health Care Agency specializes in providing home support, personal care, skilled home health and personal management services to assist people in living safely and independently at home. Helpmates, Inc. and its divisions strive to bring the best of home health services to people of all ages. 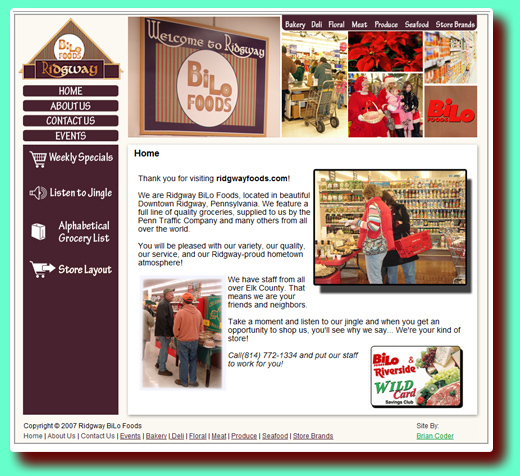 Business: Ridgway Bilo Foods is a grocery store located in Ridgway PA. Ridgway Bilo is your hometown grocerystore who offers Weekly Specials, Bakery, Deli, Floral, Meat, Fresh Produce, Seafood, and Food Club store brands. They also offer a catering service and the Ridgway Bilo "Road Hog". 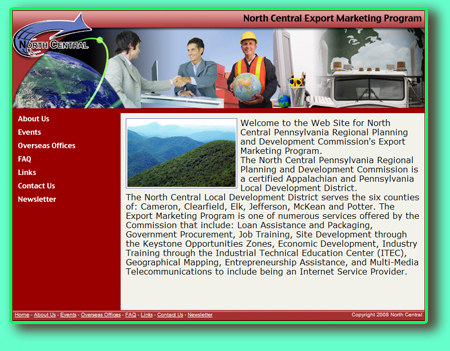 Business: The North Central Pennsylvania Regional Planning and Development Commission (North Central) is the designated Local Development District for the counties of Cameron, Clearfield, Elk, Jefferson, McKean and Potter. Located in the heart of North Central Pennsylvania, the six-county region is known throughout the Commonwealth of Pennsylvania as an emerging forerunner in industrial site location, economic growth, workforce quality, and business opportunity. Business: The Export Marketing Program provides value-added assistance to North Central clients that are interested or engaged in international trade. The major objective of the Export Marketing Program is to facilitate economic development through growth in world trade. Business: North Central Internet offers a high quality Internet service to customers. 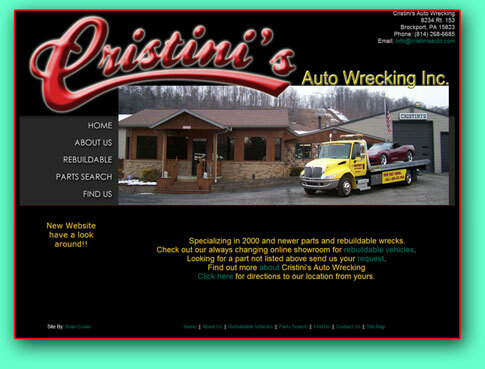 This service includes Dial-Up, DSL, and High Speed Wireless Internet access. 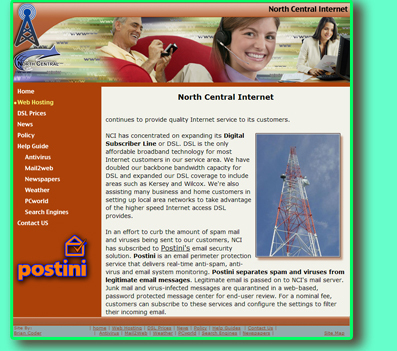 Web Hosting, Personalized Customer Support, and Spam and Virus Protection are also part of the North Central Internet package. Business: WIC provides nutritious foods, nutrition education, and referrals to health and other social services to participants at no charge. 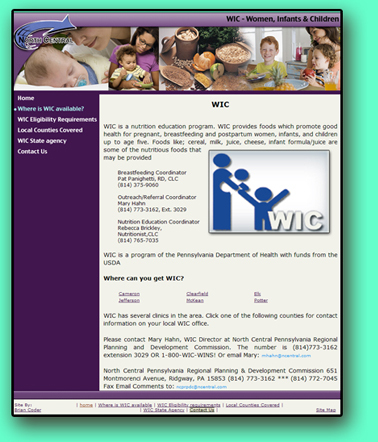 WIC serves low-income pregnant, postpartum and breastfeeding women, and infants and children up to age 5 who are at nutrition risk. 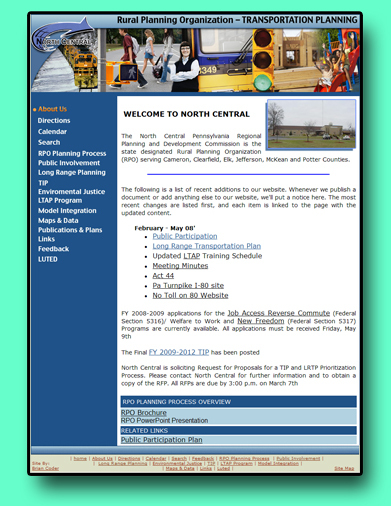 Client: North Central Workforce Development Operations. Business: The Workforce Development Operations, funded primarily with resources from the Departments of Labor & Industry, Welfare and Education, provide for a comprehensive mix of services to employ and re-employ disclocated and disadvantaged individuals throughout our region. Services are part of the CareerLink System and are driven by labor market based Consortia consisting of employers, educational representatives, community based agency representatives, faith based groups, and many others. 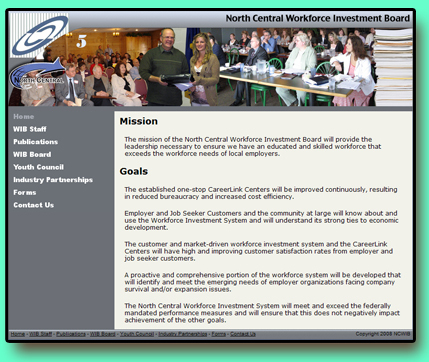 Consistent with our mission of improving the quality of life, North Central Workforce makes a significant contribution by delivering training services to our customers; the Region's workforce and employer community. Our goal is to improve the productivity, profitability and competitiveness of our regions' employers by supplying "job ready" employees. Business: The mission of the North Central Workforce Investment Board will provide the leadership necessary to ensure we have an educated and skilled workforce that exceeds the workforce needs of local employers. 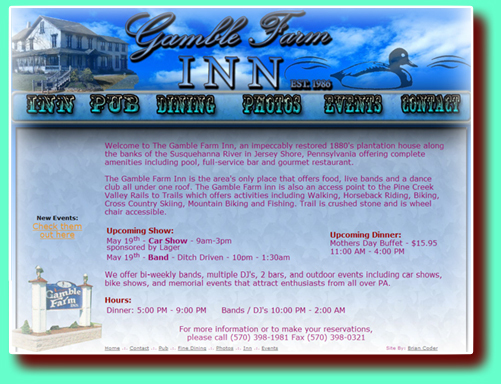 Business: The Gamble Farm Inn is an Inn and Restaurant located in Jersey Shore PA offering 2 full service bars, 3 rooms for dining, bands, DJ's, dancing, 11 rooms for your stay and one astounding cabin for camping along pine creek. 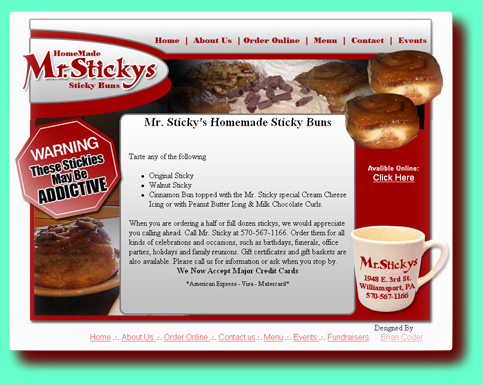 Business: Mr Sticky's is a restaurant located in Williamsport PA. Mr Sticky's offers a full menu that includes their signature sticky buns. 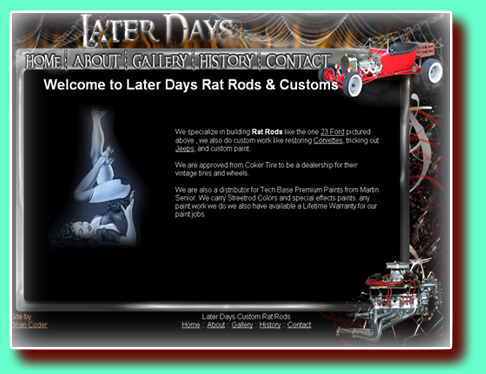 Don't wait, contact us today for your free no obligation consultation.